Monarch Nova-Strobe BBX BAX Reliability Direct, Inc. Your Direct Source for Reliability, Maintenance, Test & Measurement! The Nova-Strobe X series represents the latest in portable stroboscope technology. 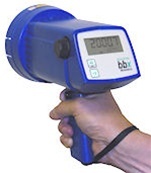 Both the bax and bbx are simple to operate, just point and shoot. Lightweight and bright with flash rates to 10,000 flashes per minute (FPM) and times 2 and divide by 2 buttons allow for differentiating true RPM from harmonics. A large dual line digital LCD it easy to adjust and read. The flash rate adjustment is quickly made with the tactile tuning knob. These strobes are light weight and comfortable to hold.